Not unusual for Italian motorcycle manufacturers, MV Agusta has had its share of financial troubles. In the 1990’s, it was struggling. But in 1998, they announced that with restructuring, they were able to continue long-term production. To demonstrate what they were capable of, they introduced the F4. If it looks familiar, that may be because it was designed by Massimo Tamburini, the same man who designed the Ducati 916. In 750cc form, the motorcycle met with rave reviews. When the 998cc version came along in 2005, the F4 1000S was lighter and more powerful than its Ducati rival. In motorcycle reviews of the time, it made the long-revered 916/996 feel heavy and slow by comparison. In 2006, this F4 1000R made the performance gap even larger. A special Ayrton Senna tribute model was also released, but limited to only 300 bikes. 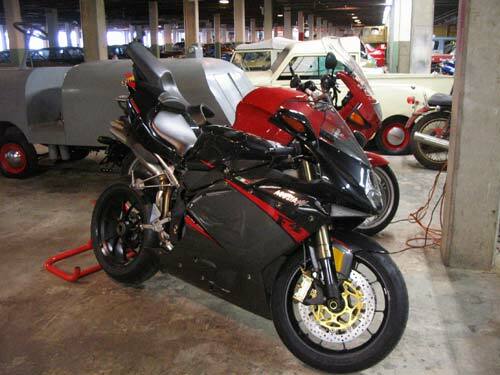 Thanks to motorcycles like the F4, MV Augusta’s future as a premier manufacturer is secure. Manufacturer: MV Agusta Motor S.p.A.